You’ll be drawn to this tiny shop front by the glistening ducks hanging in the window. Inside, you’ll hear customers haggling over the loud thuds of the meat cleaver hacking up whole barbecued ducks. The two meat and rice option means you can choose from roast duck, seasoned roast duck, pork belly or pork sausage. The char sui is tender however the fat isn’t quite rendered down enough to make it crisp. 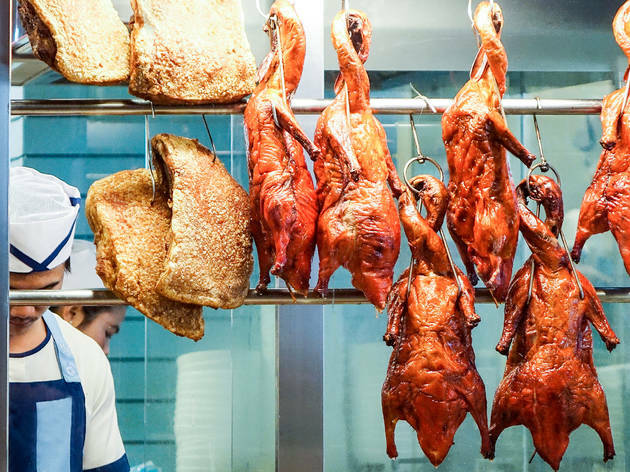 The duck is the surefire belter here – it’s ultra unctuous with auburn skin seasoned so it’s salty and crisp. Bones and cartilage are left in making it a messy mission but the succulent meat is a reward well worth the greasy fingers. 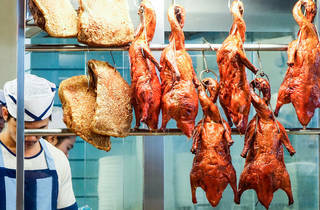 You can also get whole ducks, roast pork and sausage by the kilo here, which are super popular orders with locals.